Earlier this year, Github released Atom-Shell, the core of its famous open-source editor Atom, and renamed it to Electron for the special occasion. Imagine a world where we could build performant, data-driven, cross-platform desktop applications powered by not only the ever-growing repository of NPM modules, but also the entire Bower registry to fulfill all our client-side needs. 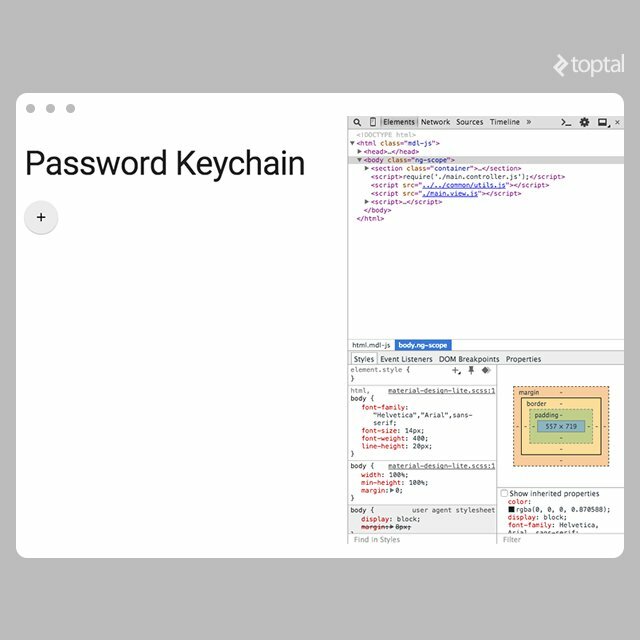 In this tutorial, we will build a simple password keychain application using Electron, Angular.js and Loki.js, a lightweight and in-memory database with a familiar syntax for MongoDB developers. The full source code for this application is available here. The reader has Node.js and Bower installed on their machine. They are familiar with Node.js, Angular.js and MongoDB-like query syntax. First things first, we will need to get the Electron binaries in order to test our app locally. We can install it globally and use it as a CLI, or install it locally in our application’s path. I recommend installing it globally, so that way we do not have to do it over and over again for every app we develop. We will learn later how to package our application for distribution using Gulp. This process involves copying the Electron binaries, and therefore it makes little to no sense to manually install it in our application’s path. To test the installation, type electron -h and it should display the version of the Electron CLI. At the time this article was written, the version of Electron was 0.31.2. … where: - cache/ will be used to download the Electron binaries when building the app. - dist/ will contain the generated distribution files. - src/ will contain our source code. - src/app.js will be the entry point of our application. We will install the necessary packages later on in this tutorial. The Main Process: The entry point of our application, the file that will be executed whenever we run the app. Typically, this file declares the various windows of the app, and can optionally be used to define global event listeners using Electron’s IPC module. The Renderer Process: The controller for a given window in our application. Each window creates its own Renderer Process. We create a new window by creating a new instance of the BrowserWindow object. It takes an object as a single argument, allowing us to define various settings, amongst which the default width and height of the window. The window instance has a loadUrl() method, allowing us to load the contents of an actual HTML file in the current window. The HTML file can either be local or remote. The window instance has an optional openDevTools() method, allowing us to open an instance of the Chrome Dev Tools in the current window for debugging purposes. … where main.controller.js will contain the “server-side” logic of our application, and main.view.js will contain the “client-side” logic of our application. We can automate this process by defining the start script of the package.son file. 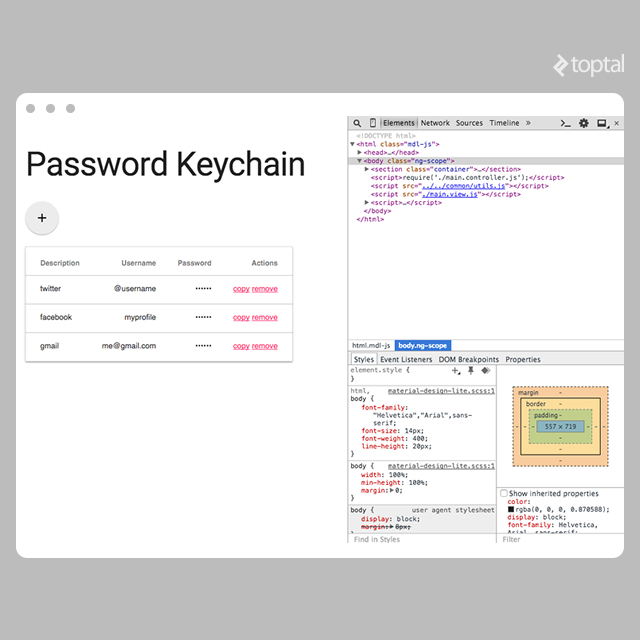 To build a password keychain application, we need: - A way to add, generate and save passwords. - A convenient way to copy and remove passwords. We will need to set the show property to false in the options object of the BrowserWindow constructor, in order to prevent the window from being open by default when the applications starts. We will need to destroy the BrowserWindow instance whenever the window is firing a closed event. One for the Main Process, allowing the app to subscribe to messages sent from windows. One for the Renderer Process, allowing the app to send messages to the main process. Although Electron’s communication channel is mostly uni-directional, it is possible to access the Main Process’ IPC module in a Renderer Process by making use of the remote module. Also, the Main Process can send a message back to the Renderer Process from which the event originated by using the Event.sender.send() method. We can name the event however we want, the example is just arbitrary. Do not forget to check if the BrowserWindow instance is already created, if not then instantiate it. isClosed() returns a boolean, whether or not the window is currently in a closed state. isVisible(): returns a boolean, whether or not the window is currently visible. show() / hide(): convenience methods to show and hide the window. Loading the script file via the HTML script tag loads this file in a client-side context. This means that, for example, global variables are available via window.<var_name>. To load a script in a server-side context, we can use the require() method directly in our HTML page: require('./main.controller.js');. There is also a sendSync() method available, in case we need to send our events synchronously. So all we really need is some kind of in-memory database that can optionally sync to file for backup. For this purpose, Loki.js seems like the ideal candidate. It does exactly what we need for the purpose of this application, and offers on top of it the Dynamic Views feature, allowing us to do things similar to MongoDB’s Aggregation module. Dynamic Views do not offer all the functionality that MongodDB’s Aggregation module does. Please refer to the documentation for more information. We first need to initialize the database. This process involves creating a new instance of the Loki Object, providing the path to the database file as an argument, looking up if that backup file exists, creating it if needed (including the ‘Keychain’ collection), and then loading the contents of this file in memory. We can retrieve a specific collection in the database with the getCollection() method. A collection object exposes several methods, including an insert() method, allowing us to add a new document to the collection. To persist the database contents to file, the Loki object exposes a saveDatabase() method. We will need to reset the form’s data and send an IPC event to tell the Main Process to close the window once the document is saved. 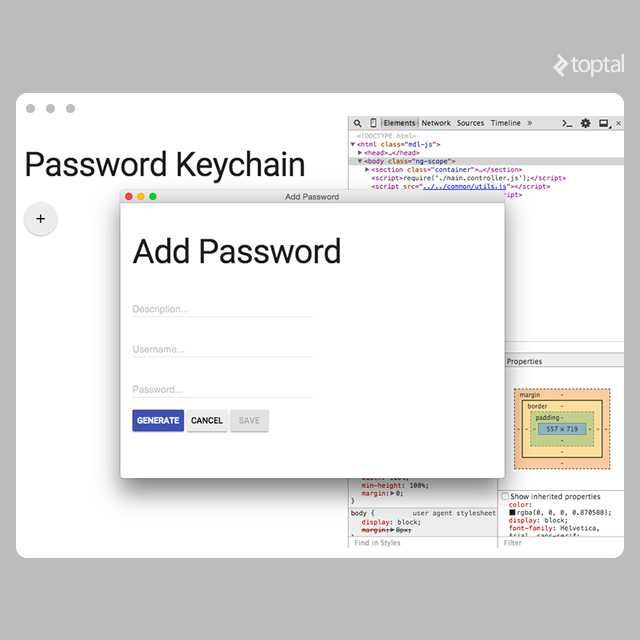 We now have a simple form allowing us to generate and save new passwords. Let’s go back to the main view to list these entries. We need to be able to get all the documents in our collection. We need to inform the main view whenever a new password is saved so it can refresh the view. We will need to use the remote module via its own require() method to require the remote IPC module from the Main Process. We can then setup our Renderer Process as an event listener via the on() method, and bind callback functions to these events. It is usually not a good idea to display passwords in plain text. Instead, we are going to hide and provide a convenience button allowing the end user to copy the password directly for a specific entry. Loki.js documentation states that we can also remove a doc by its id, but it does not seem to be working as expected. Electron integrates seamlessly with our OS desktop environment to provide a “native” user experience look & feel to our apps. Therefore, Electron comes bundled with a Menu module, dedicated to creating complex desktop menu structures for our app. The menu module is a vast topic and almost deserves a tutorial of its own. I strongly recommend you read through Electron’s Desktop Environment Integration tutorial to discover all the features of this module. For the scope of this current tutorial, we will see how to create a custom menu, add a custom command to it, and implement the standard quit command. The first item in the array is always used as the “default” menu item. The value of the label property does not matter much for the default menu item. In dev mode it will always display Electron. We will see later how to assign a custom name to the default menu item during the build phase. Electron provides “accelerators”, a set of pre-defined strings that map to actual keyboard combinations, e.g. : Command+A or Ctrl+Shift+Z. selector: 'terminate:' // OS X only!!! We can add a visual separator by adding an item to the array with the type property set to separator. The selector property is OSX-compatible only! You probably noticed throughout the various code examples references to class names starting with mdl-. For the purpose of this tutorial I opted to use the Material Design Lite UI framework, but feel free to use any UI framework of your choice. Anything that we can do with HTML5 can be done in Electron; just keep in mind the growing size of the app’s binaries, and the resulting performance issues that may occur if you use too many third-party libraries. You made an Electron app, it looks great, you wrote your e2e tests with Selenium and WebDriver, and you are ready to distribute it to the world! But you still want to personalize it, give it a custom name other than the default “Electron”, and maybe also provide custom application icons for both Mac and PC platforms. These days, there is a Gulp plugin for anything we can think of. All I had to do is type gulp electron in Google, and sure enough there is a gulp-electron plugin! This plugin is fairly easy to use as long as the folder structure detailed at the beginning of this tutorial was maintained. If not, you might have to move things around a bit. the src/ folder cannot be the same as the folder where the Gulpfile.js is, nor the same folder as the distribution folder. We can define the platforms we wish to export to via the platforms array. We should define a cache folder, where the Electron binaries will be download so they can be packaged with our app. The contents of the app’s package.json file need to be passed to the gulp task via the packageJson property. There is an optional packaging property, allowing us to also create zip archives of the generated apps. For each platform, there is a different set of “platform resources” that can be defined. OS X requires icons with the .icns file extension. There are multiple online tools allowing us to convert .png files into .ico and .icns for free. In this article we have only scratched the surface of what Electron can actually do. Think of great apps like Atom or Slack as a source of inspiration where you can go with this tool. I hope you found this tutorial useful, please feel free to leave your comments and share your experiences with Electron! What would be the best way to migrate web app ( node.js + html5) into electron based windows app? 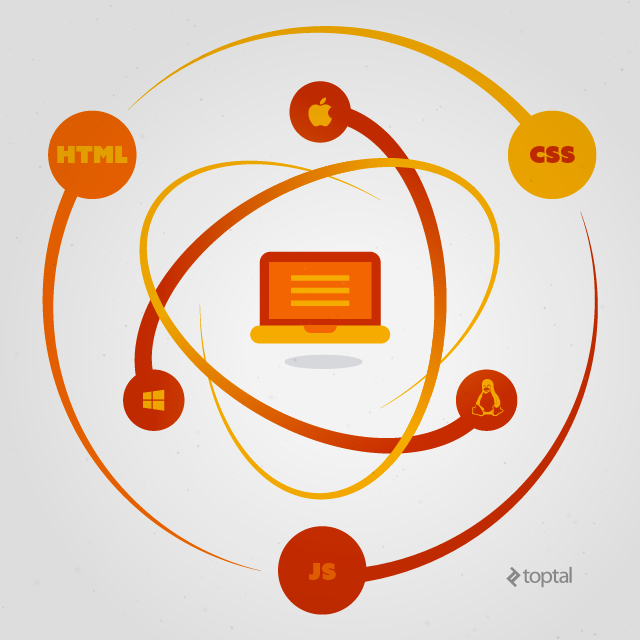 Can we migrate all features developed in web version? Excellent man I have started some time ago a project with electron https://github.com/boriscy/timecheck using babel I must say that you don't need browserify because you can require files like in io.js (node), I will try lokijs, tried other solution but didn't work. Instructions are not very clear on where to place code....I downloaded the github code and ran npm install and it just did not work at all. Thanks. i will ask more questions soon. Btw, your app on github didn't work. when I do npm install window pops up and it never ends. i've been following this cases of creating Desktop web apps, and is there any reason or pros on convert your web app to desktop? it improves performance? or is it just a new trend on make it more user friendly? Hello @sppericat:disqus I am currently getting this error when trying to create a password.https://imgur.com/gLt3aQt Followed github instructions but seems to be stuck and help would be appreciated. @sppericat:disqus Thank you for this very helpful article. However, can you explain what is the point of loading AngularJS controllers code in server context (using require()) and not in client context? I have multiple C++ programs and I want them to read input from the index.html web page and using the computed output should in turn modify some GUI elements on the index.html page. How can I do this? Thank you. I feel you've tried to explain everything, a very good attempt. When i learnt Electron, i used these resources - https://hackr.io/tutorials/learn-electron Submit it here, this tutorial.